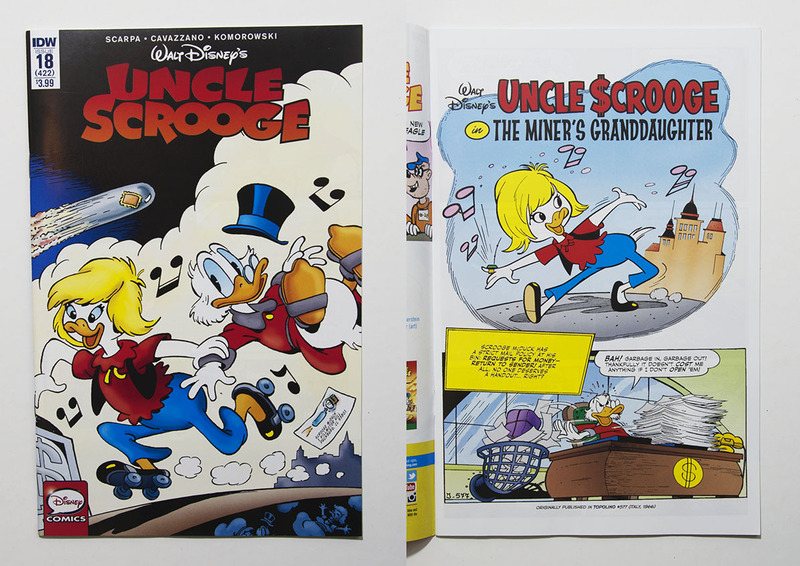 Trying to catch up on some reading again, I just finished The Miner's Granddaughter in IDW’s Uncle Scrooge #18. 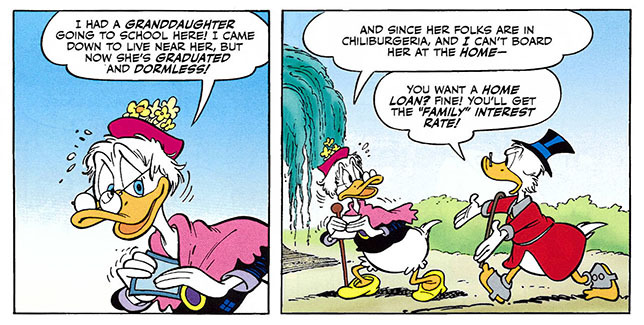 This is a story I’ve wanted to read for a long time, mostly because I was curious about the backstory of Dickie Duck and her relation to Glittering Goldie. Even if Goldie is her grandmother they only appear together in two stories! (according to inducks). And in previous English translated stories, Dickie is usually only seen in cameo appearances. The most we’ve seen of her is in Around the World in 80 Bucks where she is hitchhiking with Donald and Scrooge. I’ve read some other stories with Dickie too (not available in English), but non that really gave much information about her. So what do we learn in The Miner's Granddaughter? Well, not that much really! Apparently Goldie moved down from Dawson to Dollar City to be closer to her granddaughter. And now she wants Scrooge to bring her to Duckburg. After a bit of convincing Scrooge ends up taking Dickie back to Duckburg. The rest of the story is a typical Scarpa story with lots of action and chaos and storylines going in all directions. We don’t get to know much more facts about Dickie, we only get a showcase of her personality and "free spirit". 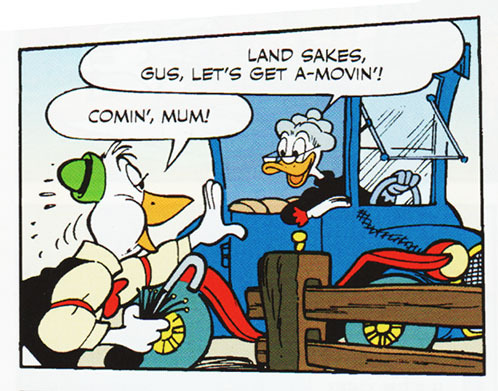 It's not one of Scarpa's best stories, but it's still interesting to see his version of Goldie and Dickie's first appearance. 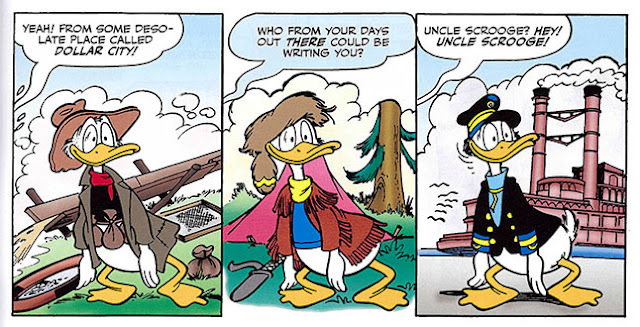 We get to see flashback scenes from Scrooge’s past and his days as a gold panner, trapper and steamboat captain – clear references to Carl Barks stories. Uncle Scrooge has an indoor western town replica to help him relive his past. Gus has always called Grandma "mum" in English-language stories—it's his country-hick version of saying "ma'am." I wonder how IDW dealt with the fourth wall breaking scene. 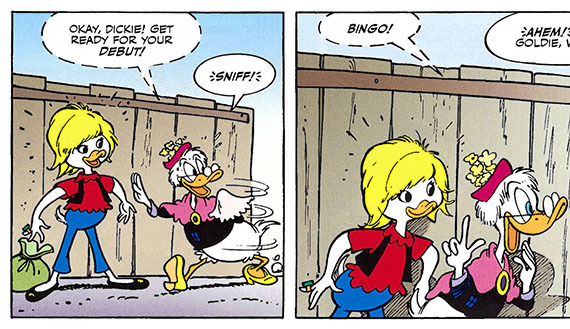 You mean the scene where Dickie pulls a Donald Duck comic out of her bag? When she jumps on land she says "Gosh! What a welcome! It's an honor to meet you all – Finally!" And then with the comic in her hand: "You're all probably the biggest influence on my creativity!" Thanks for the answer. So they did turn down a bit the fourth wall braking. Can't say it was a bad idea. In a literal translation, when she jumps on land she would say "Make room for me, guys! I couldn't wait to be with you!" And when she holds the comic (labelled TOPOLINO, with the same lettering as the real TOPOLINO comic) she would say "You know, I know all of you! I am an assiduous reader of yours" with the word "reader" in boldface.